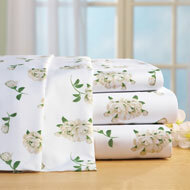 Hummingbird Embroidered Bed Sheet Set from Collections Etc. 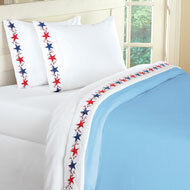 This complete sheet set is made from ultra soft microfiber and features a beautifully embroidered hummingbird design on the hem of the flat sheet and the hems of the pillow cases. 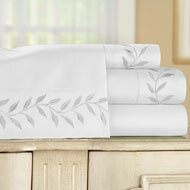 Sheet set includes 1 top sheet, 1 fitted sheet and 2 pillow cases (twin set includes 1 pillow case). Machine wash. Polyester microfiber; imported. Size available in Twin, Full, Queen or King. Really nice embroidery, nice colors. I would buy again, soft. Embroidery nice. Arrived torn. Too thin! Poor Quality! The Top sheet had a cut in it. Too late to send it back cause I threw away all the pkg. - ladynancy, Pa.